Mayoral candidate Alderman Nick Guccione tells the crowd at candidate night that he will continue to answer phone calls, have coffee meetings at his house and walk Wentzville neighborhoods for feedback on issues important to citizens. Wentzville Aldermanic candidate Donna Sherwood points out to Wentzville voters that even though not a member of the board, she has attended nearly all the aldermanic meetings over the course of the past 3 years. Wentzville aldermanic candidate Sonya Shryock brings proof to Wentzville Candidate Night that she is not associated with the Home Builders Association and decries negative attacks on her and her family. Wentzville aldermanic candidate Jeremy Pritchett gives his closing argument at tonight's Wentzville candidate forum by touting his experience at Office Depot as an Assistant General Manager. Pritchett says people are not always easy to work with and he knows what it takes to listen to peoples' issues and and hammer out solutions via good interpersonal communications. During candidate night, Wentzville Mayoral Candidate Leon Tow gives his closing statement to the 200 + crowd at Wentzville's Holt High School. He urges Wentzville citizens to stay involved in local political issues like the candidate forum tonight and he asks that they vote for him. Alderman Rick Stokes gives his pitch to a Wentzville candidate forum audience of about 200 or so people at Wentzville's Holt High School. Stokes is a local REALTOR and mentioned that skill set. As of 10:13 a.m., the Missouri St Charles County GOP caucus appears very well attended with many many folks in the meeting-gym and more still in line. Local GOP Committee chairman says everyone currently in line will have to be processed before caucus will start. Looks like 1000+ already in meeting-gym and roughly 300 more people still in line. He says punishment for coming right at ten a.m. for those still in line is that they have to wait in a "smelly wrestling room" at the school. There would appear to be no chance that the St Charles County GOP caucus will start before noon central here at Francis Howell North on Hackman Rd near the Page Extension Muegge Rd exit. 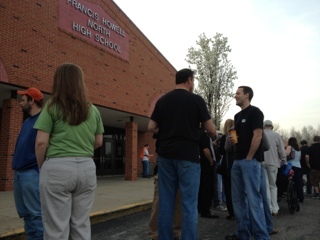 Starting before 6:00 a.m. this morning, GOP caucus goers began trickling into the parking lot of Francis Howell North Highschool on Hackman Rd in St Charles County. The crowd consists of young and old with a couple purveyors of political paraphernalia. Joe Wetter and Bryce Steinhoff with the Ron Paul effort appear well-prepared and apparently represent the only campaign with any operatives on the ground for the event. One said that the Ron Paul supporters make-up 99% of the line for the caucus thus far, but will likely change as the official ten o'clock start time nears. Attitudes seem chipper with some chatter about the new i-pad HD by Apple which came out yesterday. 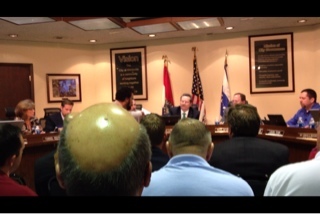 UPDATE (VIDEO) Wentzville Red-Light Cameras To Go Dark -- Vote Appears Unanimous Against RedFlex Renewal, Stokes Says "No" to "Woo"
In spite of the Wentzville Police Chief Harrion's strong recommendation to keep the cameras, the aldermen were not swayed and voted to terminate the RedFlex red-light camera contract. At one point, City Attorney Paul Rost warned the aldermen that voting out RedFlex would result in RedFlex attempts to "woo" the aldermen to change their opinions. The current contract doesn't appear to run out until 2013, but the aldermen decided to vote it down tonight nonetheless. Some aldermen cited the necessity of officer discretion at traditional in-person red-light traffic stops, while Mayoral candidates Nick Guccione and Leon Tow referenced the inconclusive nature of Police Chief Harrison's red-light camera accident prevention data. 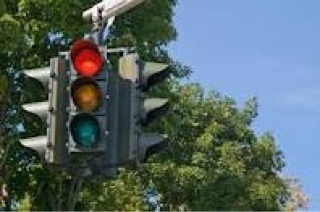 Cheryl Kross added that the city or Missouri Department of Transportation need to extend yellow-light times and seek conformity throughout the city signal systems. Mayoral candidate Darrel Lackey was present and his physical demeanor seemed to indicate agreement with the RedFlex contract termination. Wentzville's Mayor Paul Lambi took his aldermanic Mayor's report time this evening to prevail upon journalists Joe Scott and Raymond Castile to properly report investigative information Lambi provided them during the meeting concerning a $15000 check written from the City of Wentzville to Westplex LOC -- a company the mayor helped cofound. 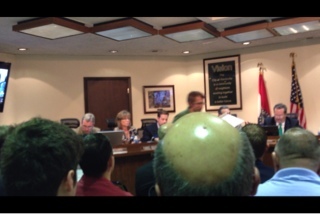 Aldermen Cris Gard had allegedly brought the check into question. See YouTube video -- may need to copy and paste in your browser. Attending the Ron Paul caucus training at Lindenwood University in St. Charles Missouri today was a sure ticket for Ron-Paulians to get premium seating in Lindenwood's Hyland Arena to see the Doctor at 3 p.m. Many fervent Ron Paul supporters refer to him as the "Doctor" or "the Good Doctor." Dan Stewart, a distribution specialist, was there and simply said he was "here to see Ron Paul." "It's neat to see the crowd grow and grow," he added. Dan wasn't into chanting when the "Ron Paul, Ron Paul, Ron Paul" mantra ebbed and flowed; rather, he seemed to be curious about the event and interested in what type of people came to a Ron Paul speech. Stewart asked if this reporter had read any of Ron Paul's books and added that if I needed one or two, I could borrow his. When Ron Paul entered "stage left," this reporter was a bit surprised. On television Congressman Paul doesn't come off as a WWE wrestler, but his diminutive 120 pound frame is more noticeable in person. However, it is noteworthy that Paul's suit was a good fitting one as opposed to some he wears that appear a bit over sized. Regardless of suit size, it is readily apparent that the crowd sees Paul only as a giant of their cause and thinks his message of liberty, self-direction and government constraint is "bigger than the city lights down at Times Square." said one on-looker. Pretty sure that is a quote from a 1990's Notorious B.I.G. song. However, the gentleman did not sing it. Cynthia Davis, Constitution Party candidate for Missouri Lieutenant Governor, was at the Lindenwood Ron Paul event. Indeed, she was there from the very beginning, starting with caucus training at 1 p.m. Central. One has to wonder if Davis will attend the St.Charles County caucuses next Saturday morning the 17th to win delegates for Ron Paul. She is the former chair of St. Charles County's Republican committee who Ron Paul's camp fears will possibly oversee Robert's Rules of Order during this year's caucuses. Paul's supporters seemingly over-ran the St. Charles County caucuses in 2008 and had to battle the GOP establishment to ensure that Paul's delegates were properly awarded. 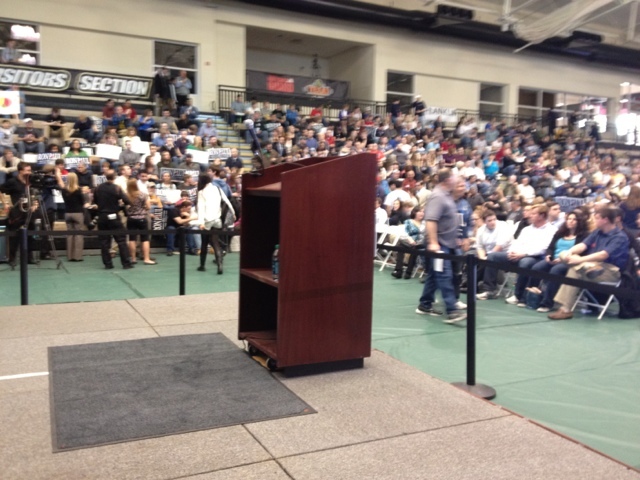 Ron Paul is curiously absent from the Lindenwood gymnasium floor. The crowd is swelling. Caucus training before the main event was well organized and felt like pre-battle preparations more than informational seminar. The New Wentzvillian will be on site for Ron Paul's Caucus Training and the St. Charles County Town Hall at Lindenwood University from noon-ish throughout the rest of the day (roughly 5 p.m. to 6 p.m. we would guess). E-mail carter@NewWentzvillian.com if you have any questions, thoughts or otherwise. We will be checking it regularly. Or, you can leave a comment on this blog. We assume that we will be close to the stage during the Town Hall as preferred seating is given to those attending the caucus meeting at 1 p.m. The New Wentzvillian is working on press credentials for the press pool. We are meeting event organizer Brent Stafford on site. New Wentzvillian readers. Do not despair. We are not taking lightly our story on Suburban Journalist Steve Pokin. A fair and objective piece takes a while to tackle -- think professional vs. sandlot journalism. Our directive is to explore the relationship between opinion columnist and objective reporter; can one person successfully and responsibly do both? 5) The Patch.com has seemingly weighed in on Pokin's community influence. 6) Several St. Charles county citizens share commentary. 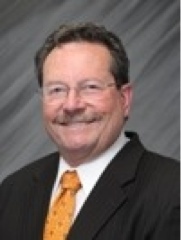 7) Steve Pokin may have changed his name several years ago. If any of our readers have questions or insights, please share them quickly as I hope to get this out Monday morning, the 12th of March, 2012.